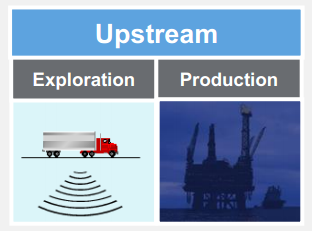 What is Upstream Oil and Gas? The upstream oil and gas segment is also known as the exploration and production (E&P) sector because it encompasses activities related to searching for, recovering and producing crude oil and natural gas. The upstream segment is all about wells: where to locate them; how deep and how far to drill them; and how to design, construct, operate and manage them to deliver the greatest possible return on investment with the lightest, safest and smallest operational footprint. The exploration sector involves obtaining a lease and permission to drill from the owners of onshore or offshore acreage thought to contain oil or gas, and conducting necessary geological and geophysical (G&G) surveys required to explore for (and hopefully find) economic accumulations of oil or gas. There is always uncertainty in the geological and geophysical survey results. The only way to be sure that a prospect is favorable is to drill an exploratory well. Drilling is physically creating the “borehole” in the ground that will eventually become an oil or gas well. This work is done by rig contractors and service companies in the Oilfield Services business sector. Plug and abandonment, which marks the end of the productive life of a well. That event can occur anywhere from a few years after the well is drilled to five or six decades later. 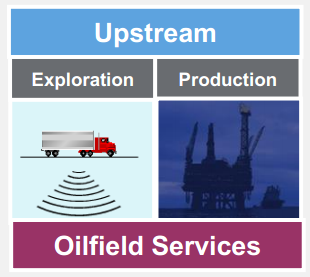 The upstream industry is arguably the most complex of all the oil and gas business sectors. As illustrated in the diagram, it is highly capital-intensive, highly risky, and highly regulated. Upstream investments are high-risk, given that results of every well drilled are unpredictable. Additional risk arises from safety and environmental issues. Upstream is also subject to global forces of supply and demand, economic growth and recessions, and crude production quotas. Additionally, seasonal weather patterns and disruption due to severe weather events when working in exposed locations can affect production. Technology drives all aspects of the upstream industry, adding to its capital-intensive nature. The oil companies that focus solely on Exploration and Production are called Independents. Many of them have in the recent past set a strategy to focus primarily on natural gas prospects – not oil. Large global independents are often publicly traded on their home country stock exchange and include such companies as EnCana, Woodside and others in the list. The largest US publicly traded independent E&P companies include Anadarko, Apache and Devon. Independents are known for their ability to make decisions and move quicker than other industry participants described below. They are also considered early adopters of the more innovative drilling and production technologies. Major Oil Companies (also called Integrated Oil Companies – IOCs) also have assets in the downstream — the refineries and service stations that bring the products to the end-user customers. These companies have the prominent and advertised brands that you are familiar with. National Oil Companies (NOCs) are those industry participants that are owned and managed by governments around the world. Most of the remaining oil & gas reserves in the world are owned by NOCs – making it a challenge for Majors and Independents to sustain their operations and grow. The Oilfield Services sector of the Upstream segment consists of companies that build the infrastructure and provide the specialized equipment, services and skills needed for exploring, drilling, testing, producing, maintaining and reclaiming crude oil and natural gas wells. Oilfield Services is a multi-billion dollar global industry. Numerous companies in this sector are among the world’s largest. Others are smaller, regional, or independent businesses that have also developed cutting-edge technologies. As mentioned in the History of Oil module, Mitchell Energy, founded by George Mitchell, was an aggressive E&P company that pioneered new techniques in horizontal drilling and hydraulic fracturing. The perfection of these new drilling methods in the 1990s enabled the boom in US shale oil and gas production boom currently underway. Mitchell Energy was eventually acquired by Devon Energy, another large independent. Oilfield services and supply companies do not typically produce oil and gas or own the assets that contain them. However, the oil and gas companies could not develop or operate fields profitably without the Oilfield Service companies’ contributions. At a typical drilling well site, there could be 25-30 different oilfield service companies handling the mechanical, technical and analytic operations needed to successfully complete a well. As the chart indicates, several factors characterize the Oilfield Services sector. It is intensely competitive with numerous global participants, and the negotiating power is squarely in the hands of the oil and gas companies who control the budgets for well services and field equipment. It is highly cyclical and affected by outside forces such as commodity price fluctuations and shifts in political sentiment. It is technology-, capital-, and labor-intensive. Companies find it increasingly difficult to attract skilled workers – as represented by the wage inflation experienced new shale producing areas of West Texas and North Dakota. The US Philadelphia Stock Exchange Oil Service Sector index (symbol: OSX) tracks public companies in this sector. Exploration services involve use of seismic methods to evaluate where and how to prove a drilling prospect, high-speed computers and advanced, 3D, visual interpretation theaters. Drilling services include well design, drilling rig operation and process, and related technologies. Other services include formation evaluation, logging, and measurement while drilling (MWD). Well completion involves bringing the production on line with advanced downhole equipment applications, downhole monitoring and automated well control equipment. Production services involve application of various physical and chemical processes to increase the amount of oil or gas that can be extracted from a field, and removing contaminates to get ready for sale. Offshore construction contractors provide design and construction of platforms, drilling rigs and sub-surface well completion equipment. Now that you have an understanding of the major players in oil & gas and what they do, let us explain the business, technical and commercial drivers to successfully bring these commodities to customers. Proven reserves are the estimated quantities which geological and engineering data demonstrate can be recovered in future years from known reservoirs, assuming existing economic, technical and operating conditions. Proven reserves have a more than 90 percent probability of recovery, while probable reserves have greater than 50 percent probability of recovery. Engineering estimates are the summation of production forecasts based on a series of quantitative tools that use well data and production histories to estimate remaining oil or gas in place. Other definitions related to public company reporting of reserves are set by the Securities and Exchange Commission (SEC). Rules in place since 2010 allow proven and probable reserves to be stated in annual reports. Prior to this update, only proven reserves could be reported. This move brought the US rules in line with international standards. Oil and gas are also termed hydrocarbons because they are chemically made up of Carbon and Hydrogen atoms. Oil and gas are not found in easy-to-access underground pools or puddles but, instead, are trapped in various rock formations and geological structures in quantities that can range from minute to massive. 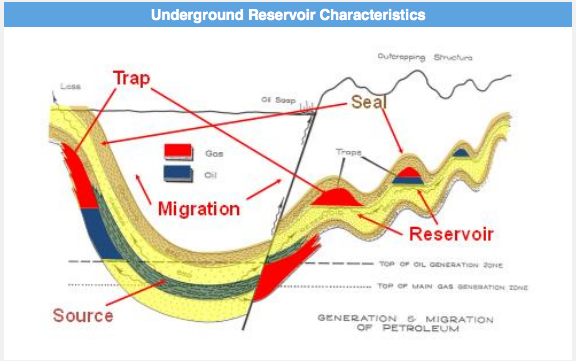 Natural gas is sometimes mixed with oil but often found in separate reservoirs. Oil and gas companies and their oilfield services providers construct wells to find the reservoirs and traps to produce the hydrocarbons to the surface. Once produced they can then be processed, transported, and refined into gasoline, fuel oil and raw materials for thousands of other products. There are hundreds of different grades of crude oil that come out of the ground. Most commonly, the crude will be described as light or heavy and sweet or sour. Examples include Light Louisiana Sweet (LLS), West Texas Intermediate (WTI), and Petrozuata Heavy. Light crude oils produce a higher percentage of gasoline and diesel in the refining process. Additionally, since sulfur and other impurities must be removed from the crude oil prior to refining, sour crudes have a higher cost of processing. Therefore, Light and Sweet crude oils sell at a premium in global markets to Heavy and Sour grades. Next Module – What is Midstream? As its name implies, the midstream segment encompasses facilities and processes that sit between the upstream and downstream segments. Activities can include processing, storage and transportation of crude oil and natural gas.